In 1997, ‘98, and ‘99 our radio station did a concert at the American Airlines arena and there were close to 23,000 people there. To DJ a set in front of 20,000 people, and to feel like a superstar for a second, like an icon, it feeds the ego. You feel important when you’re on stage like that. Any other recent moments? I did a prom for a big high school recently and it was cool because the van I was driving with all of the equipment, I was able to drive it into a freight elevator. The elevator lifted the van with all the equipment so I didn’t have to carry up the equipment. 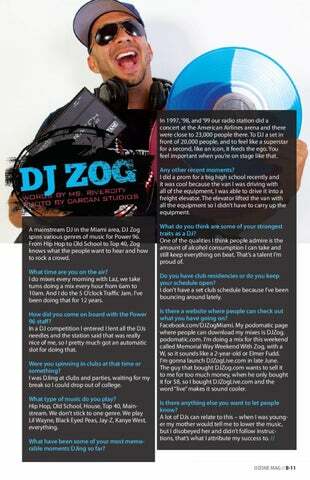 A mainstream DJ in the Miami area, DJ Zog spins various genres of music for Power 96. From Hip Hop to Old School to Top 40, Zog knows what the people want to hear and how to rock a crowd. What do you think are some of your strongest traits as a DJ? One of the qualities I think people admire is the amount of alcohol consumption I can take and still keep everything on beat. That’s a talent I’m proud of. What time are you on the air? I do mixes every morning with Laz, we take turns doing a mix every hour from 6am to 10am. And I do the 5 O’clock Traffic Jam. I’ve been doing that for 12 years. Do you have club residencies or do you keep your schedule open? I don’t have a set club schedule because I’ve been bouncing around lately. How did you come on board with the Power 96 staff? In a DJ competition I entered I lent all the DJs needles and the station said that was really nice of me, so I pretty much got an automatic slot for doing that. Were you spinning in clubs at that time or something? I was DJing at clubs and parties, waiting for my break so I could drop out of college. What type of music do you play? 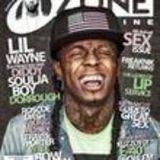 Hip Hop, Old School, House, Top 40, Mainstream. We don’t stick to one genre. We play Lil Wayne, Black Eyed Peas, Jay-Z, Kanye West, everything. What have been some of your most memorable moments DJing so far?